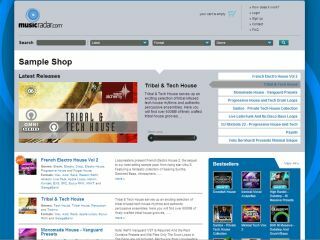 The MusicRadar sample store: find out what's new. MusicRadar's sample store is now open for business, offering you the complete catalogue from UK sample boutique Loopmasters. The store's library of samples and soundware is constantly being added to, so to help you keep up to date with what's new, here's a rundown of the titles that have been added during the past week. Loopmasters are very proud to present a collection of fresh and original sounds and samples for producers of dub, grime, urban, dance and dubstep music, from one the pioneers of dance and dubstep. Patchworx 11 - House Synths for the Z3TA+ soft synth, is a collection of bass, pad, lead, synth and FX presets exclusively created by Justin Harris for Loopmasters. If you are using the Z3TA+ synth and want a highly useable collection of freshly crafted presets from a top producer then this collection is for you. Loopmasters are proud to present a fresh collection of tech loops and samples for house producers looking for a new slice of inspiration for new tracks and remixes. This collection of tech house samples has been inspired by artists including Nick Curly, Steve Lawler, DJ Sneak, Butch, Roberto Rodriguez and Andy Lee. Rankin Audio presents a pack of all the synth, FX and vocal risers you will ever need. Anyone with their finger on the pulse will know about Moombahton. Being championed by the likes of Major Lazor, Dillion Francis and Diplo and even Skrillex, it combines heavy ethnic drum patterns, fierce leads synths and pitch bent vocals. Dubstep demands first class beats with plenty of snap, bite and body to cut through those twisting, diving, seesawing wobbling basslines, and Dubstep Beats has every ounce of that combined with the best ultra-flexible MIDI grooves out there!